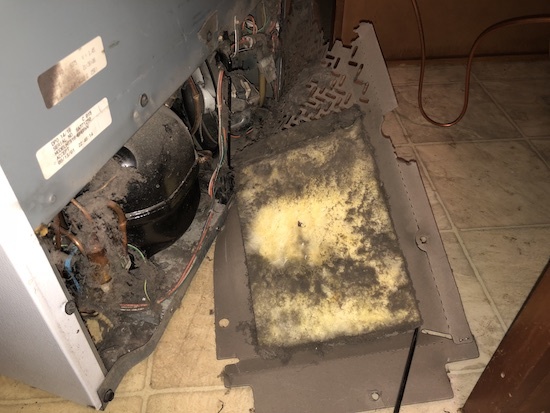 This refrigerator was causing poor indoor air quality in the home. 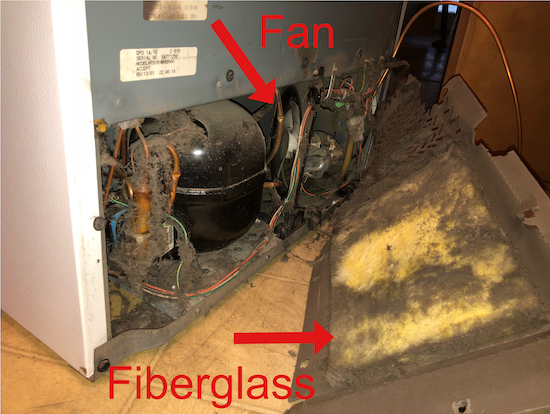 The cooling fan is moving air next to fiberglass and blowing it into the house. In our huge, long undertaking of removing fiberglass from our lives we found yet one more source. I knew it was in the kitchen. When I walked into the other rooms where the fiberglass had already been removed the air was noticably better. My lungs told me something was off about the kitchen and the source felt strong. This is something I could never tell before we had removed the fiberglass from the rest of the house. But now that most has been taken out I am better able to pin point what is left. We decided to check behind the refrigerator. Bingo! Fiberglass. 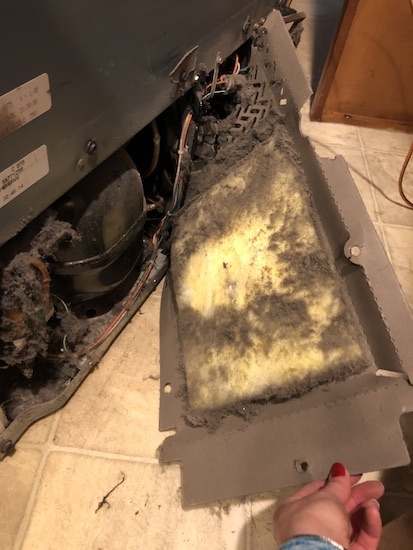 It was not just sitting there sealed in, it was next to the cooling fan which was moving an air current right across it. It also acted like a sponge trapping in dirt. 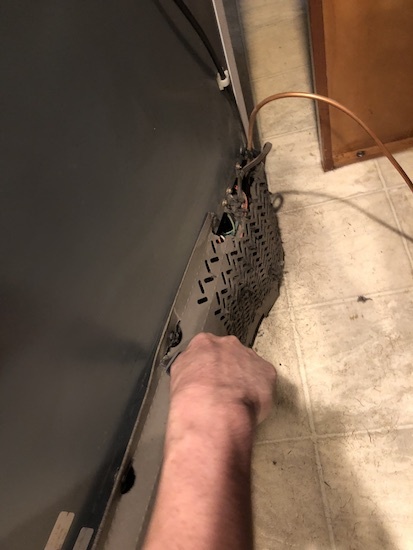 We plan on getting a new refrigerator, but for now we just removed this panel. 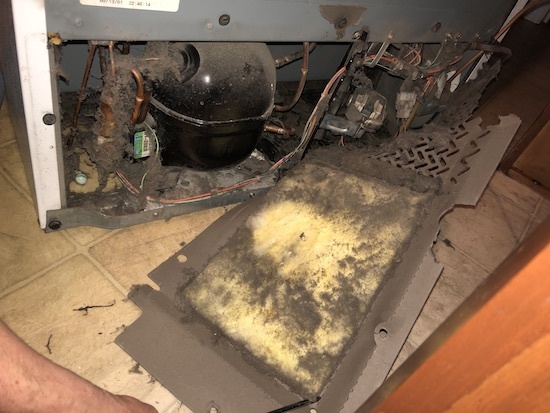 The fiberglass appeared to be for sound control as it was placed across the compresser and was not insulating the refrigerator itself. 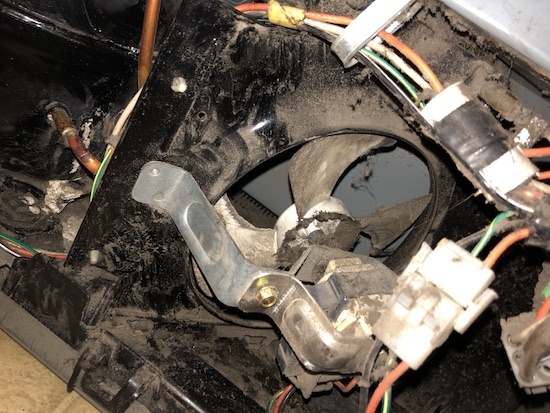 The cooling fan that was moving air around the fiberglass. Going fiberglass free is not easy, it is literally everywhere. After being sick for decades the effort is worth the improvement in our health. We came across the airborne glass issue by chance and it has drastically changed our lives for the better.